Take a seat. Please sit down. As students we hear these commands countless times throughout our days at school. Having people sit down has become such a simple and ubiquitous method of maintaining organization in classroom and workplace settings---it’s become part of society in such a way that we don’t even need to think about it anymore. But when our homeroom teacher, Mrs. Guinane, shared some of the recent statistics about health issues related to sitting for long periods, we were shocked. None of the students in our class were very surprised that long periods of inactivity would negatively impact health---our school, as a Health and Wellness Academy, encourages physical activity all the time as an aspect of healthy living---but sitting for long periods of time is exactly what we do at school every day. Our school is set up for sitting: the benches in the cafeteria, the rows of desks and “seating arrangements” in the classrooms, the chairs lined up in front of each computer in the lab, the couches in the library. We are expected to sit for basically every class except for gym. We started brainstorming ideas and asking questions about what we could do to make students’ experience at school a healthier one. We knew not everyone would be convinced at first---the teachers especially might be skeptical about classroom management with students standing up. So, we decided to start with our own class to see how it would go. For about a month, Mrs. Guinane gave us the choice of standing up or sitting down during lessons, discussions and work time. We each recorded data about how long we stood and how we felt physically, mentally, and emotionally, before, during and after standing. Our immediate observations were surprising. It was difficult to get used to standing up. Our bodies, first of all, had to adapt to these new conditions. But it wasn’t only that, because our newly gained rights also came with a set of responsibilities. We would be allowed to stand as long as we made reasonable decisions on where we stood and made sure we were not obstructing anyone’s view or being distracted by people we were standing beside. Our experiences with standing up varied from person to person. There were some extremely athletic students who chose to sit most of the time as a way to rest their bodies. For others, standing presented many great health benefits---one student in our class found standing up was an effective way to control her blood sugar, which she needs to monitor because she has Type One Diabetes. Many of us felt that standing up improved focus throughout long lessons, and we all appreciated having the choice to sit or stand. It was refreshing and we made good use of the natural light by using the windowsills and counters in our classroom as work surfaces. 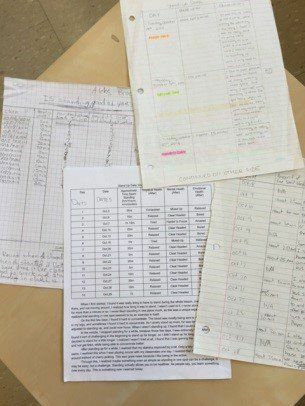 After a month of collecting data and comparing our results with one another, we came to a conclusion at the end of our little experiment. We felt that standing did in fact improve the states of our physical and mental health, and that it can be managed at school as long as the terms, conditions and consequences are all communicated clearly from the beginning. Being in one of Canada’s Health and Wellness Academies, we decided that we would keep working on this project to optimize standing in class and further integrate it into the other classes in our school. We felt like this was an experience that all the students at Donview could benefit from. However, our experiment was not without its problems. We discovered many issues related to the work area available to us. We were making do with our classroom’s counters and windowsills as tables to write on while standing, and several of us brought our own clipboards to use. These options were all quite uncomfortable and inconvenient, however, as the workspaces were cramped and work surfaces were narrow and the wrong height for standing with proper posture. What we really needed to make the project work was stand-up tables. The next step was to invite our school principal and superintendent into our classroom to present our ideas to them and ask for some funds to purchase stand up tables. We got to work, organized in three different committees. The research group looked for some sustainable alternatives to our current stand-up equipment. We needed something that was sensible and affordable, and we ended up with a variety of options, ranging from music stands to store-bought options, to custom-built cardboard stand-up tables--but they were all quite expensive. 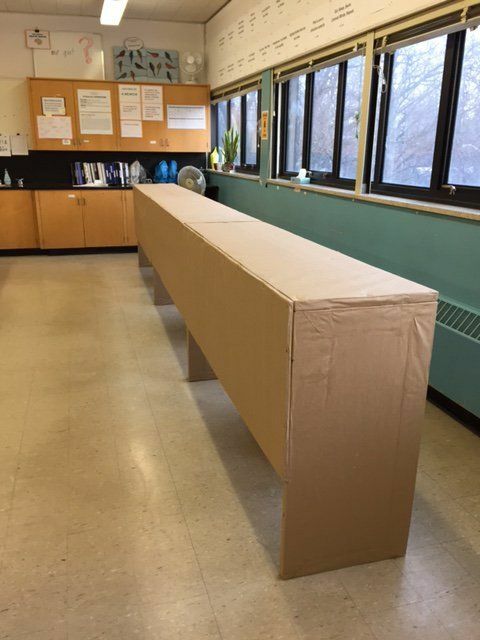 Luckily, Yasmeen Tian, a student’s parent, already had experience in making cardboard furniture and stepped in to help. 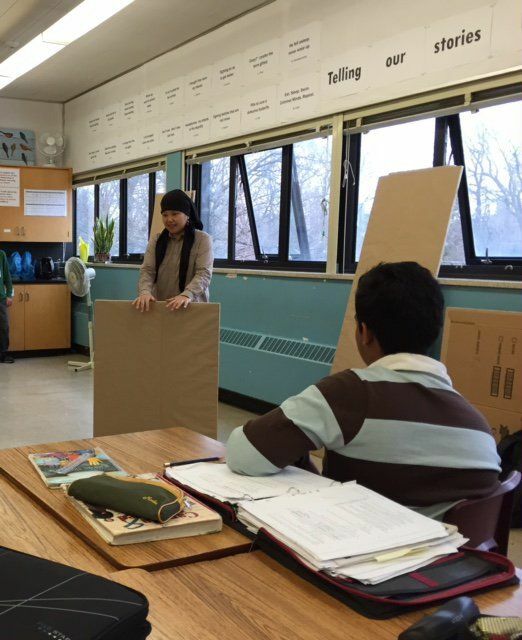 Ms Tian offered to design and create tables to fit 3 or 4 standing students. 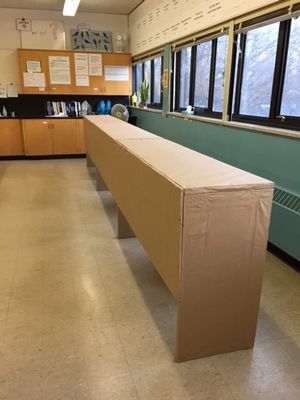 Each table would be just over waist-high, made of only cardboard, tape, paper, glue and nails: a creative, eco-friendly and locally-made initiative. While we waited on the completion of our tables, our presentation committee planned for the big day. We managed to compress all our ideas and experiences about stand-up education into a thirty minute presentation for our superintendent and principal, which (although slightly nerve-wracking) was definitely a rewarding experience. In the end, they agreed to support our initiative and we received some great feedback. Our tables (three in total) came in soon after, IKEA-style, in the form of several cardboard planks. We learned about Ms Tian’s creative process while we helped her with the assembly. When we finished, we all truly felt a sense of accomplishment. Our project had blossomed from an idea to reality and it was finally taking off. Now that we have proper furniture, we continue to stand in class when we choose and enjoy the mental, emotional and physical health benefits that standing brings. But we, the documentary committee, don’t want things to end here. We want to share our story with more students, teachers and administrators and spread the word about our project. Some day we hope to see standing up as an option for every student in every classroom. We have stood up against sitting down. Will you? 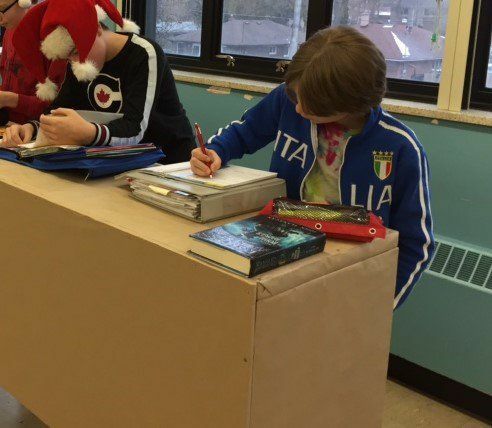 Teacher’s Note: Standing during lessons and work periods is now routine for my grade 8 class. They monitor themselves constantly throughout the day and make responsible choices about when and where they stand. Encouraged by the success of the project, I opened up the option to stand to my two rotary classes. So far their feedback has been very positive! Other teachers, both at my school and at other schools, have expressed an interest in including stand up options in their teaching spaces. I am happy to answer any questions or support you if you plan on embarking on a similar project of your own. If you already use stand up tables in your classroom, I’d love to hear about your experience too!